Rent Renault Duster in Kiev is for those who often travels not only on flat roads, but also off-road. Thanks to the versatility, dynamics and superb handling of the compact crossover, neither pits nor bumps will be scary. An unpretentious, reliable and dynamic car has well proven itself on both urban and country roads, as well as during travels outside the city. Rent Renault Duster in Kiev is beneficial not only because of the functionality of the car while driving, but also because of the possibility of obtaining aesthetic pleasure. The car has an expressive exterior and an attractive interior. At the same time, the interior elements have a convenient location and are as ergonomic as possible. Restyling model with a mechanical transmission is equipped with a powerful diesel engine (110 hp), designed for 1.5 liters of fuel. Therefore, renting Renault Daster in Kiev will easily and without incident overcome any descent and recovery. Simple and "obedient" in the management of cars is pleased with the ability to overcome roads with potholes, thanks to the presence of an energy-intensive running gear. Even with constantly loaded city traffic, the car economically spends fuel. 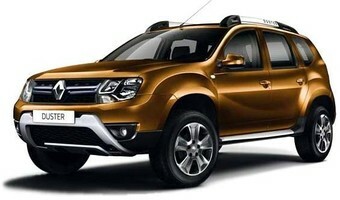 So renting Renault Duster in Kiev is not only a safe, but also profitable solution. climate control and safety systems. You can hire a car in Kiev for any period and on favorable terms (even without collateral). Rental customers are guaranteed to receive a fully manned crossover in perfect technical condition.